Hi friends! 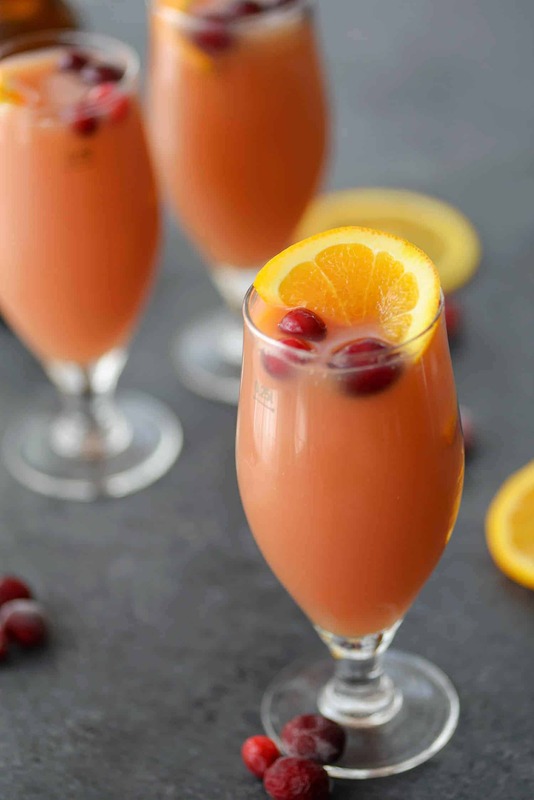 Popping in quickly this morning to share with you this fun beverage, a cranberry orange shandy. If you’re hosting friends or family this weekend, this is such a simple cocktail to make that doesn’t include lots of booze. Which makes it the perfect ‘lets-get-this-party-started-at-2pm’ drink. I can handle a beer at 2, I cannot handle anything stronger. Plus cranberry and orange juice, so antioxidants. Isn’t this color just gorgeous? It reminds me of a sunset cocktail, but I prefer the bite of a yummy wheat beer over rum or vodka. Ever since having V, I’ve been really into beer which is pretty strange for my taste buds. After living in Northern California for a decade, I’ve become an amateur wine snob, an occupational hazard for anyone who lives that close to Napa. But beer? Eh. I could take it or leave it. These days though, I’m definitely taking it. I’ve been enjoying a small glass almost nightly, everything from hoppy IPA’s to chocolate milk stouts to regular pilsners. I don’t even recognize myself. BL, my sweet husband from Wisconsin, introduced me to shandys the first summer we started dating. I had never heard of them before, but I guess they are the drink of summer in northern Wisconsin. Tart, slightly sweet and perfectly refreshing, they’ve become one of my go-tos on hot days. 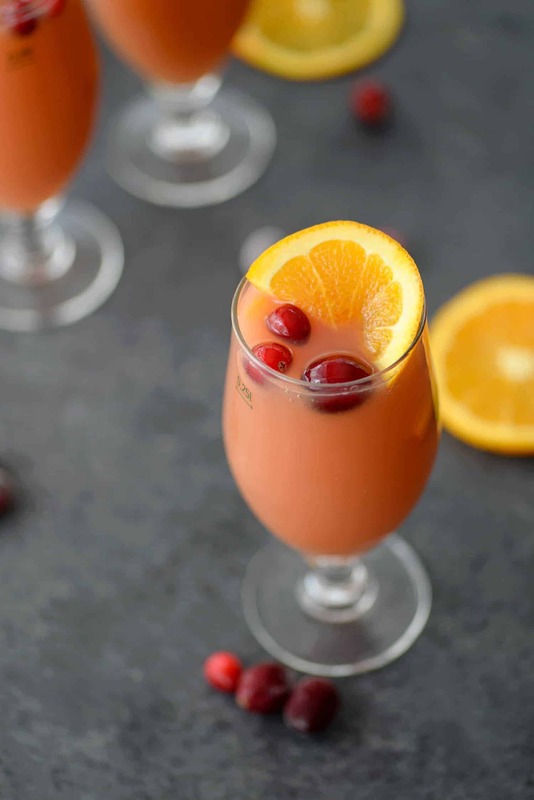 Though I usually prefer the classic with lemonade, this cranberry and orange version is just as tart and perfectly festive for fall. Plus, easy. Like, silly easy. Three ingredients easy. Make a pitcher and serve them tomorrow (or any gathering this holiday season) as this recipe scales very easily. I recommend a good wheat beer for this one, other varieties won’t work. 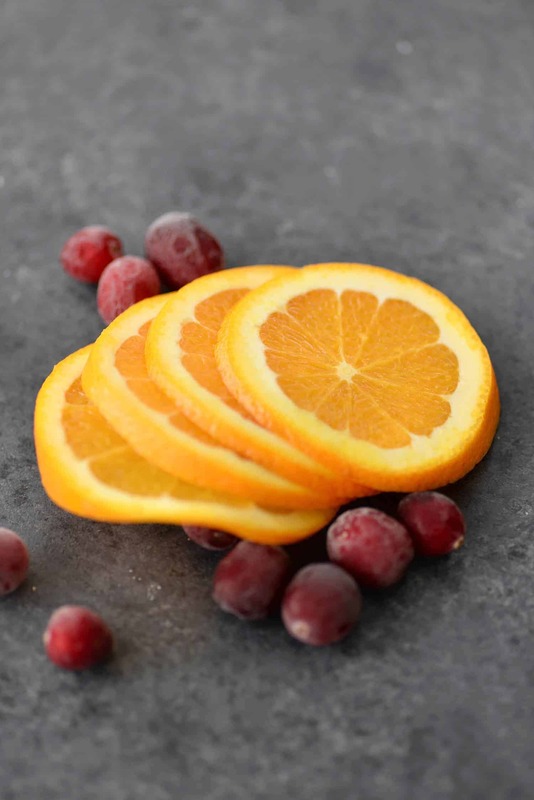 Don’t forget to garnish with fresh orange slices and fresh cranberries for a festive touch. 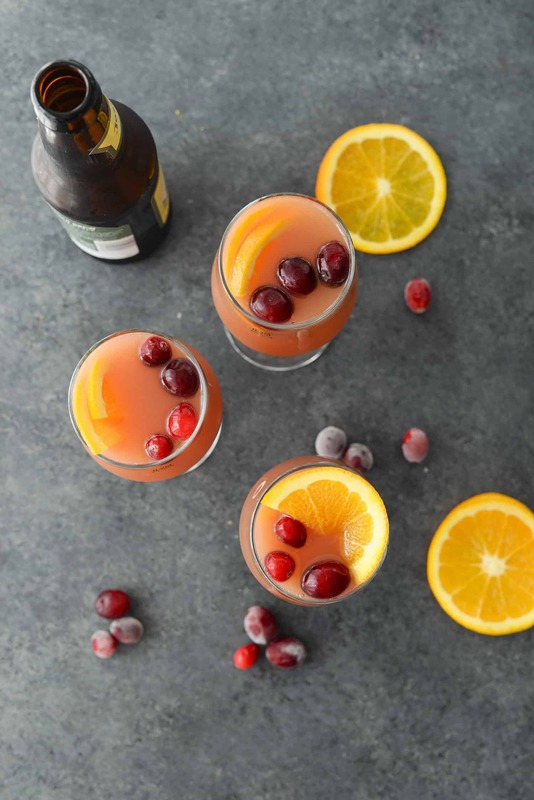 Cranberry Orange Beer Shandy! 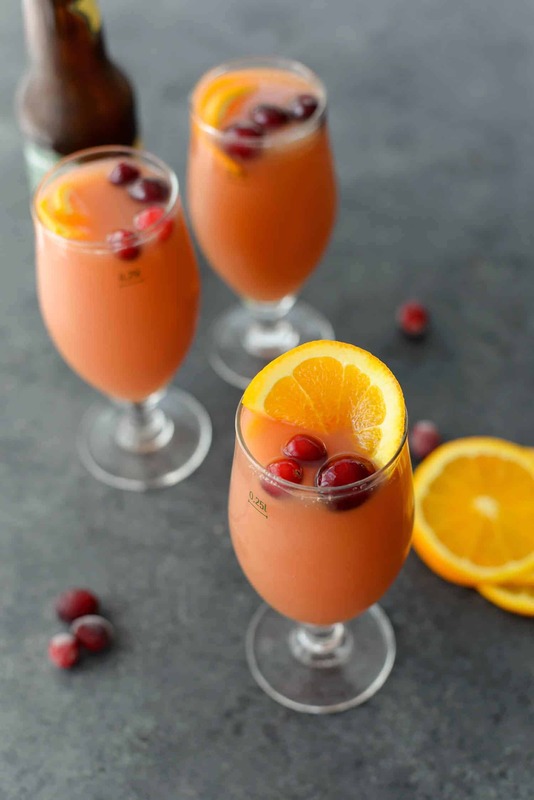 You’ve gotta try this three ingredient cocktail, perfect for holiday and christmas entertaining. Refreshing, delicious and can easily be made into pitchers for parties. Make sure your ingredients are ice cold before serving; I prefer this in a mug straight from the freezer. Combine the juices together then top with beer. 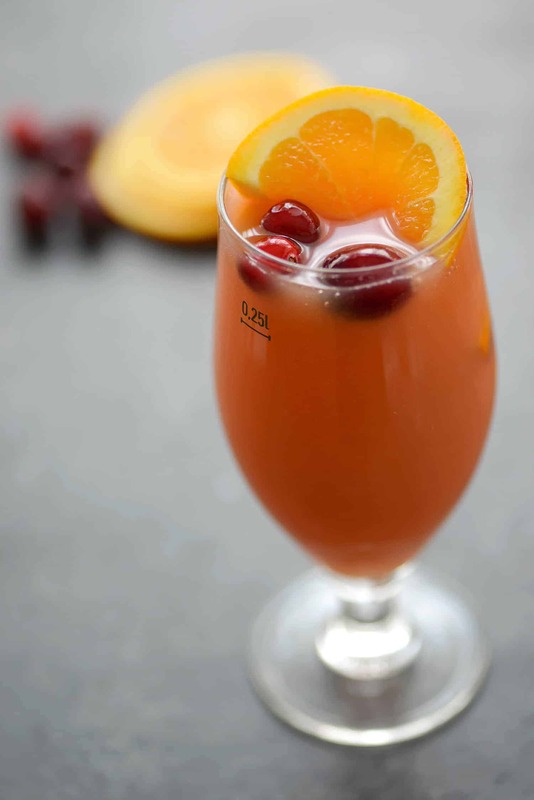 Garnish with orange and cranberry and serve. See notes for multiplying and pitcher measurements. This recipe is for one, so multiply by how many you are serving. This one doesn’t do well made ahead of time since the beer will fall flat. To turn into a pitcher- combine the juices and place in the fridge. Right before serving, add in the fruit and beer.